Have a Party ‘Like a Boss’ in Our Luxury Krystal Bus! Hiring a party bus has become a popular way to celebrate any event, and we know exactly how to do it in style. If you are seeking a roomy and yet comfortable party bus that can easily accommodate up to 15 passengers, and will still have plenty of space, then our luxury Krystal bus is just what you are looking for. Our luxury Krystal bus can be used for weddings, bachelor or bachelorette parties, proms and much more. 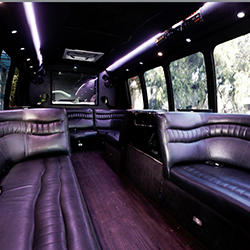 Our extravagant fleet of party buses is sure to compliment all of your special needs for your special occasion. Planning an event can be stressful sometimes. Why don’t you hire our luxury Krystal bus, sit back and relax. Whether you’re planning a large party or a night out with friends, our party busses are perfect vehicles to celebrate your special events. We’ll make sure you party in style and luxury! The Krystal bus is the perfect vehicle to turn your party mood on and experience the city in a way that you never have before. We have the best party bus fleets in the city and our premium services can be yours at an affordable rate. Get in touch to find out more on our Krystal Bus packages and customize your Krystal bus trip. To find out more about our luxury Krystal bus service and custom packages please feel free to contact us today. Our customer service representatives are always on hand 24/7 to answer all of your questions and queries. Our business representative can also help you select the best package according to your specific requirements. Or you can easily make a booking online.